Diagnostic imaging allows veterinarians to see inside a horse’s body without the need for surgery. X-rays are probably the best-known type of diagnostic imaging, but many others are available to help diagnose illnesses and other health problems in horses. Each type of diagnostic imaging has its own advantages and disadvantages. None of these are perfect for every situation. Your veterinarian will suggest one that best fits the needs of your horse. Some of these tests are available in most veterinary practices, but others may require a visit to a special veterinary diagnostic-imaging clinic. An x-ray, also known as a radiograph, uses a type of radiation to make a two-dimensional, black-and-white image of the inside of a horse’s body. The radiation passes through the body and lands on either a special X-ray film or a digital recording device connected to a computer. Tissues such as bone — which are denser — show up as white on the X-ray image. Less dense areas — such as the air in the lungs — will appear black. X-rays are commonly used to diagnose bone fractures, to look at the shape of the lungs and heart or to look for foreign objects or accumulated fluid in the body. X-rays are the most affordable type of diagnostic imaging, so they are often the first one done. The radiation used during an X-ray can, over time, harm the horse or those holding the horse. Therefore, care must be taken to avoid exposing the horse (or the handlers) to too much radiation or too often. X-rays work well for structures like bones and the lungs. However, they may miss things when the density of the structure is not much different from the surrounding tissues. Sometimes a chemical (contrast medium) is injected into the body to make certain structures show up better on an X-ray. During computer axial tomography (CAT or CT scan), an X-ray tube moves around the body and sends X-rays through the horse’s body at different angles. A computer uses this information to create images of thin slices of parts of the body. As with X-rays, denser parts of the body will appear whiter and less dense ones will look blacker. The CT scan provides a greater level of detail than regular radiographs. It is often used to look for problems in the lung, brain or spinal cord. The use of a contrast medium can make certain structures stand out even more. During a CT scan, many images are taken, so the horse must be anesthetized to keep it from moving. CT scan machines are very expensive, so the cost of this test is much higher than a simple radiograph. In addition, the horse is exposed to radiation; although, the amount depends on the type of image being captured. Magnetic resonance imaging (MRI) uses strong magnets and radio waves to create very detailed images of the body. The MRI machine is connected to a computer, which turns the information from the scan into images. A contrast medium can also be used to see certain areas of the body more clearly. MRIs are the most expensive type of diagnostic imaging, because the machine often costs more than $1 million. In addition, because of the very strong magnets use, the machine has to be housed in a special facility. However, this test is often the best way for a veterinarian to diagnose certain problems in horses. As with the CT scan, the horse has to be anesthetized during an MRI scan. Unlike CT scans and radiographs, though, the MRI does not use radiation. However, any metal in the horse’s body can be a hazard due to the strong magnets of the machine. This includes any metal implants or shrapnel. Instead of radiation, ultrasound uses sound waves to create images of the organs inside a horse’s body. This type of imaging is painless, so the horse will not need anesthesia or sedation. In addition, an ultrasound shows details that are not visible on X-rays, such as the organs in the horse’s abdomen. However, ultrasound doesn’t see well through bone or air. For that reason, it is often used alongside X-rays to provide a veterinarian with a better picture of the horse’s health. Ultrasound equipment is expensive, so this test is more likely to be available at larger clinics. Some areas of the country, though, may have a traveling ultrasound machine to provide ultrasounds at clinics without them. Nuclear scintigraphy is a type of imaging that uses small amounts of radioactive material to provide information about how well the horse’s heart, lungs, kidneys or other organs are working. Depending on which part of the body is to be looked at, the radioactive material may be injected, swallowed or inhaled. Special cameras can detect the radiation. This provides information on where the material moves or collects in the horse’s body. This diagnostic imaging is not used very often in veterinary medicine. The main reason is that the radioactive materials are very expensive, are governed by strict rules about how they can be used and need to be handled very carefully. 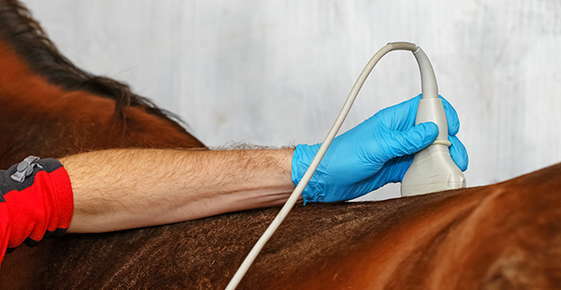 Infrared thermography is a diagnostic imaging technique that uses a special camera to measure the heat given off by the surface of a horse’s body. Different temperatures show up as different colors on the camera’s screen. This test is often used to identify areas of lameness. However, some non-veterinarians may use this equipment to take scans that are essentially useless. It is best to consult with a veterinarian who has been trained specifically in the use of infrared thermography.